Truly, if there is anything better New Years morning (or any morning) than fresh, warm, homemade cinnamon rolls, I don't know what it is. 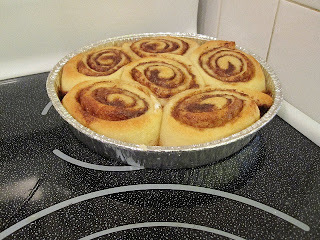 Last year I made cinnamon rolls as well but they were anything but traditional. Featuring orange zest (an addition I still hear complaints from my brother about) and a brown sugar topping. This time I wanted to make something more familiar. However, my biggest problem with the traditional cinnamon roll is the insanely sweet icing (surprise surprise) they’re normally drenched in. Sometimes it doesn’t matter how good the actual roll is since all you can taste is sugar. But I wanted classic so I needed an icing that was sweet but not sweet enough that my dentist heard cash registers (KA-CHING!). Making cinnamon rolls always seems like more work than it is, but it’s not the work, it’s the time. You have to have a few hours to prepare the dough and let it rise, then add the filling, roll and bake. But if you set aside time to prepare the day before and leave them in the fridge over night, come morning, you’ll be a few short minutes away from breakfast bliss. To me the worst part of the entire process is cutting the rolls. No matter what I’m cutting I can’t seem to figure out how to get equal portions; cakes, pies, bread, cheese (ha ha), whatever. I have even managed to turn round cakes into rectangular ones. Yes, it’s that bad. And when you’re like me and manage to roll your dough more oval than rectangle, your difficulty is magnified. One of the more unusual things about this particular recipe is that it calls specifically for disposable round cake tins, which I went out of my way to buy. If you choose to use metal ones your bake times might be slightly less. However, next time I am going to use a rectangular pan. The middle roll in the first batch was not as done as those surrounding it (a bit doughy), but the second batch was perfect once I adjusted the timing. The original recipe also makes a ridiculously large batch, 35 by my calculation, so if you want to freeze some for later, by all means use the original amounts. In my case even a half batch seemed like a lot. Thankfully when faced with something so delicious my family and I have little resistance. And truly they were delicious. How could they not be? The roll was light and fluffy with the right amount of chew; the filling was rich with the flavour of brown sugar and cinnamon; and the topping, although traditional, offered that extra kick of pure sweet without overpowering the bun or the filling. Combined with the incredible smell wafting throughout the house and a piping hot cup of coffee, you have a breakfast normally reserved for divinity. 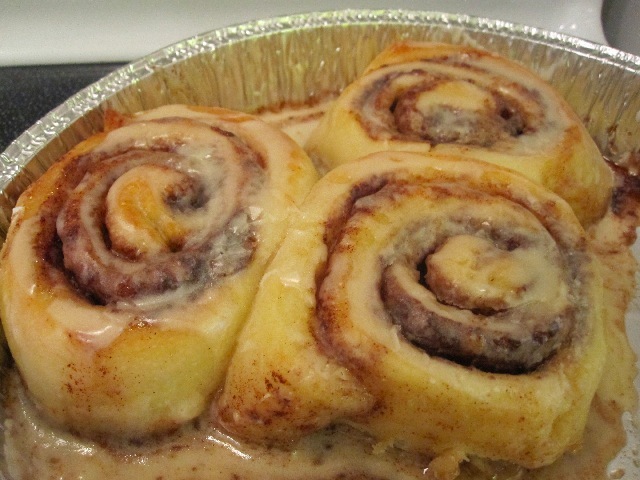 It’s my opinion that if you have never had a fresh cinnamon roll you owe it to yourself to bake some. Set aside some time on a Saturday to prepare, and wake up a bit earlier on Sunday to bake. Trust me, one bite and your problems, your stress will just melt away. My only suggestion is to make sure you're sitting down, lest you be standing and your knees buckle. But for the sake of all that is holy DON’T DROP THE ROLL! You can always eat it on your way to the hospital :). In a medium pot add milk, oil, and sugar and whisk to combine. Turn burner to medium and heat mixture until almost boiling, whisking constantly. Remove from heat and let cool for 45 to 60 minutes (you want the temperature to be lukewarm). Once cooled add yeast and gently whisk to combine. Allow yeast to dissolve until it begins to froth, roughly 5 to 10 minutes. Add 4 cups of flour and stir to combine. In a small bowl add remaining half cup of flour, baking powder, baking soda, salt and whisk to combine. Grease 3 8.5” disposable cake tins with cooking spray or butter. – Although the rolls will bake fine in any shape pan, my recommendation would be rectangular. If you choose to use a metal pan your bake time might be slightly less. In a small bowl add both sugars and whisk to combine. After the dough has risen, punch it down and remove from pot. On a lightly floured surface roll dough out to a rectangle (or as close as you can get). You are looking for roughly 18”x12” to 18”x14” rectangle. (Use your judgment. There will be a point when the dough doesn't want to stretch easily anymore). Pour melted butter over dough (a brush helps to spread, but there will likely be some runoff). Evenly sprinkle sugar over buttered dough. Evenly sprinkle cinnamon over sugar. Slowly roll dough towards you length wise, trying to keep as tight a roll as possible. Cut the log into pieces roughly 3/4” to 1” thick and place in cake pans (I fit 5 to 6 per pan) and allow to rise for 30 minutes. If rolls were chilled overnight allow them to come to room temperature and then rest for 20 minutes before baking (if you let them rest on the stove while its heating up they’ll re-rise a bit more quickly). Bake rolls on middle rack for 15 to 20 minutes or until rolls are golden (mine took 17 minutes). Remove from oven and allow to cool in pan on rack for 5 minutes before icing. (The rolls can also be frozen at this point). As the rolls are baking, add powdered sugar, milk, cream, vanilla and salt into a medium bowl and whisk until smooth. Pour icing over warm rolls.